Teens Say They Change Clothes And Do Homework While Driving : Shots - Health News So they do seem to get that texting is dangerous. But putting on makeup and contact lenses at 65 mph? No problem. Researchers in Oregon are trying to train teenagers on the risks of multitasking. Hey, I'm not texting. Surely this is safe. While most teenagers recognize that texting while driving is a bad idea, they may be less clear about the risk of other activities – like changing clothes. Twenty-seven percent of teens say they sometimes change clothes and shoes while driving, a study finds. 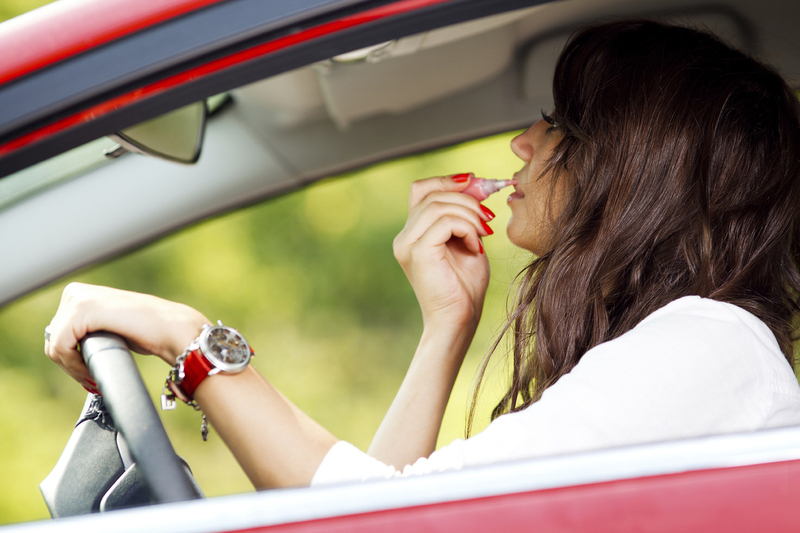 They also reported that they often change contact lenses, put on makeup and do homework behind the wheel. "We were pretty surprised at the changing clothes bit," says David Hurwitz, an assistant professor of transportation engineering at Oregon State University who led the study. "Teens are busy, I guess." The good news is that awareness campaigns about texting while driving are working, Hurwitz says; in his survey, around 40 percent of the teenagers said they texted behind the wheel, which is lower than in earlier studies. "But there are all sorts of other distractions and teens have no awareness of the risks," Hurwitz notes. Talking on the phone, changing radio stations and adjusting the GPS setting can be just as distracting – and dangerous – as texting, he says, and driver education programs should focus on teaching kids to avoid any sort of multitasking behind the wheel. Distracted driving is a leading cause of accidents among drivers of all ages. The researchers also asked the teens surveyed to participate in an interactive drivers education class in high school in Oregon, Washington and Idaho. To help kids understand the risks of distracted driving, the researchers had try multitasking in less potentially lethal locales, like the classroom. For example, instructors asked students to try writing down numbers on a chalkboard while having a phone conversation. "This was just a scenario to demonstrate that having a distraction can really prevent you from doing basic tasks," Hurwitz says. After participating in the 20- to 40-minute course, the study found that students were slightly better at recognizing the risks of multitasking behind the wheel. The results were published Monday in the Journal of Transportation Safety and Security. "This study seems promising," says Bruce Simons-Morton, a behavioral scientist with the National Institutes of Health who researches adolescent driving and accident prevention. "There really hasn't been much research on how you can convince teens to alter their behavior through classroom interventions," he notes. "So this is a good start." Other research shows that parents also play an important role in nudging teen drivers toward safety, he adds. While cell phones are the biggest distraction for both teens and adults, Simons-Morton notes, "doing anything that requires the driver to take his or her eyes off the road is dangerous. So the most important message they need to hear is 'Keep your eyes on the forward roadway.' "